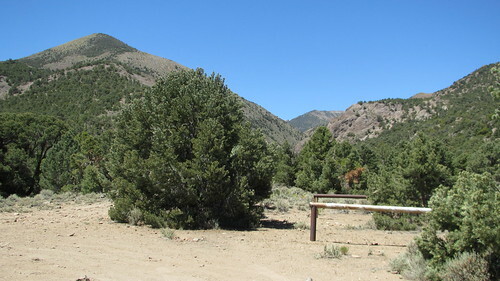 We moved our vehicle from the Pine Creek Campground to the Mount Jefferson / Pine Creek trailhead, a drive of about 2 minutes. There’s not much there besides what I think are hitching posts for horses, and an old outhouse that probably hasn’t been used in a few decades. 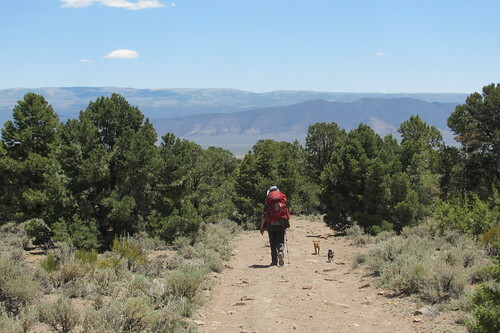 There was nobody else here, so we just picked a big pinyon pine to park next to and then unloaded our packs. After getting the packs on, we hiked up an access road to get to the canyon trail and the Alta Toquima Wilderness beyond. We wouldn’t see another person for three days. We weren’t even quite a mile into our hike when we decided we needed a break, the energy from our breakfast already fizzling out. 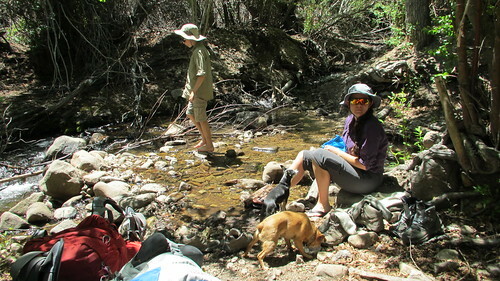 We stopped at a creek crossing to cool off and clean up in the cool water. After rehydrating and having a good snack, we felt like we were ready to start the climb for real this time. 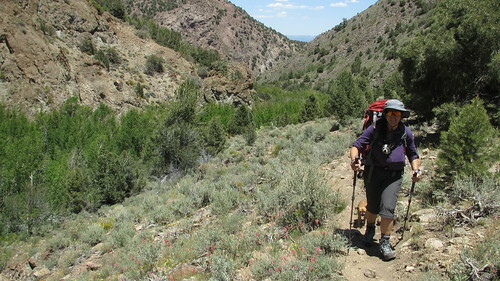 Hiking along Pine Creek was quite enjoyable, even in the summer sun. 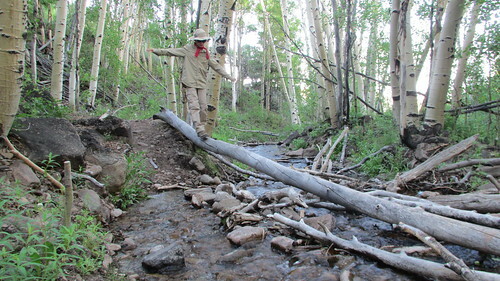 Aspens along the creek provided frequent shade, and recent trail maintenance by volunteers made for smooth hiking. 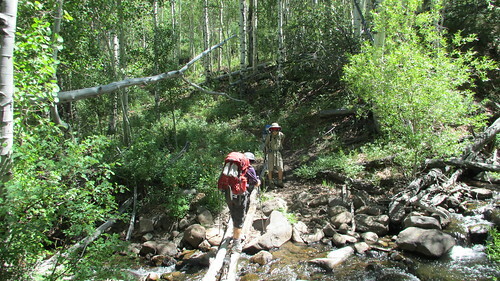 The trail frequently crosses the creek, but there were always enough rocks and logs available for dry crossings. Every once in a while the trail would climb above the creek and give us good views of where we’d been and where we needed to go. 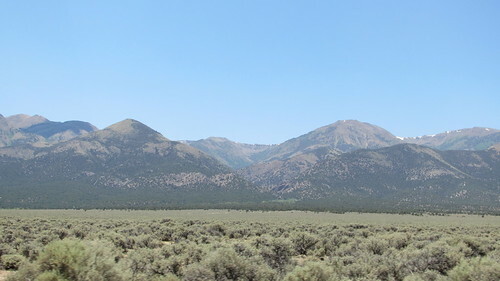 The landscape kept changing the higher we got, becoming less desert-like, transitioning to mountain greenery. Wildflowers including Indian Paintbrush and Mules Ear were everywhere. 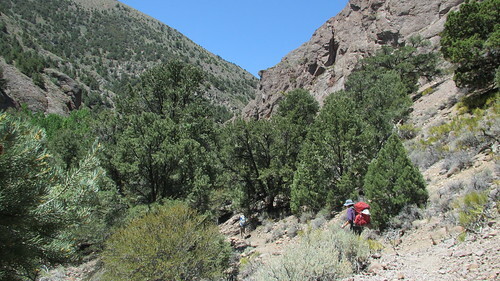 We hadn’t seen any mosquitoes the whole trip, but after last year’s hike in central Nevada, I was on the watch for ticks. We hadn’t seen any all morning, but once we got to a certain elevation, we all started picking them up on our shoes and socks. Thankfully they were easy to spot and remove before they bit. We had a discussion though, debating which were worse, mosquitoes or ticks. Although creepy and slow, the ticks bothered me less than persistent swarming mosquitoes. Kristy and Charlie argued, however, that it’d be much worse if you missed a tick and it creeped into your socks or shorts to bury its head in you. Both sides of the argument had valid points. Thankfully, once we climbed a bit higher, the ticks seemed to go away. We planned to get as high as we could this first day, not wanting to have to walk too far to make the summit the next day. 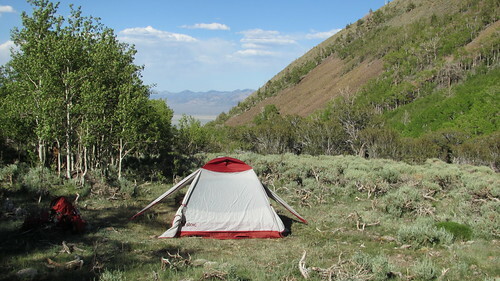 Eventually we began to tire though, so we began scanning for a good campsite. We didn’t find much that looked suitable for quite some time. It was either too much of a slope, too rocky, the grass was too tall, or it was a site that looked barely big enough. Finally we took off the packs, and I scouted ahead. I found a few potential sites, but then came to a wide spot in the canyon at 9,300′ elevation with a nice clearing in the sagebrush. About the only drawback were the numerous cow flops, but they’d be easy enough to kick away. 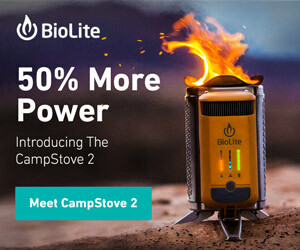 Maybe I’d even burn a few. I hiked back down the trail to share the good news. We went to work getting the clearing transformed into a nice little campsite. After getting the tent setup, Kristy went to work on dinner, and I filtered some water from the creek before building a little fire ring. Branches from sagebrush and mountain mahogany littered the area, more than enough for a good fire. It cooled off quickly when the sun went behind the mountain, and the fire was a welcome treat. 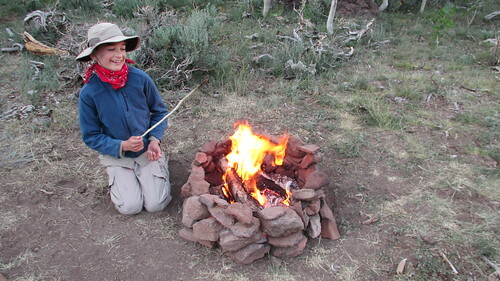 Charlie even whittled a stick to roast a few marshmallows that he brought along. The next morning, we prepared to climb Mount Jefferson. 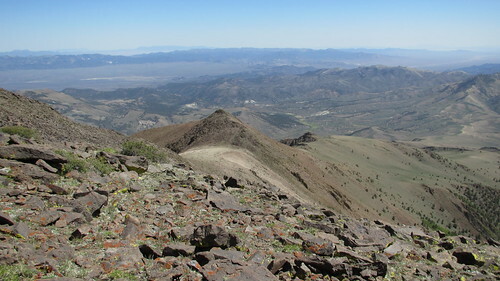 The south peak is the 6th highest peak in Nevada, and the high point of the Toquima Range at 11,949′ (3,642 m). 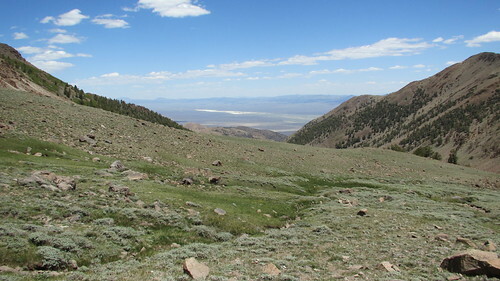 It was still a few miles away, and over 2,600′ above us. It always looks so much closer on the map! 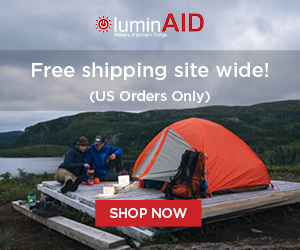 We packed only what we’d need for the climb into our day packs, and left the rest at camp. A short ways up the trail we found the campsite the guidebook recommended. I had been keeping my eye out for it the day before, but never saw it. It was funny to find it right around the corner. It looked pretty nice under the aspens, with log benches and a big fire ring, but I was still glad we stayed out in the open for the views. 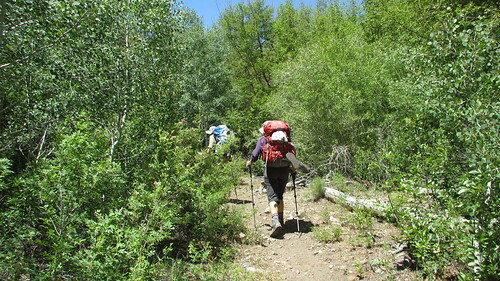 The trail climbed steeper now, up and up through the shady aspens. 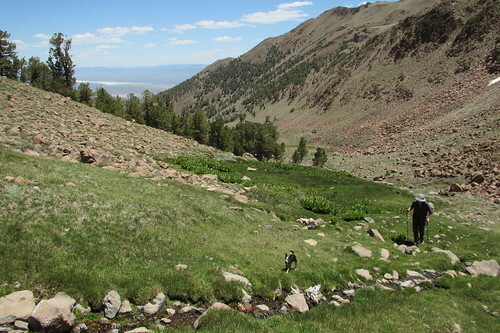 We eventually came to an open meadow and the trail crossed the creek. It made the perfect spot to rehydrate and clean up. Much of the water here entered from nearby springs, so I decided to explore the area for the sources. While the cattle poop was more of an annoyance below, it just made a mess of this meadow. The poor springs were mostly trampled as well. It was a good reminder to always treat your water, because you never know what the source looks like. The cattle have probably been coming up into this canyon for decades during the summer months, but it does make you wonder if cattle really are compatible with wilderness. According to my GPS map, the trail kept to the south of the creek after the meadow. The trail disappeared as we hiked up through the meadow, so we just followed the creek. Sometimes the water would disappear, only to reappear again where it was fed by other sources. 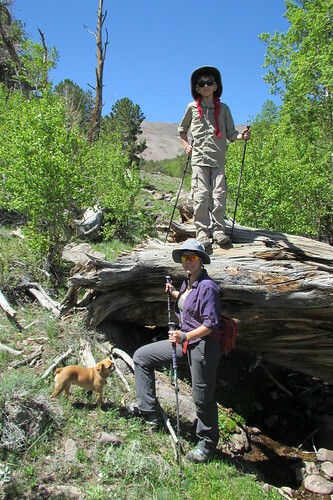 Occasionally we walked on something resembling a trail, but mostly we hiked the rocks along the creek, through the trees above the creek, and across open meadows. One of the more strange things we witnessed in the meadows were the spiders. Thousands of spiders carrying egg sacs scurried off in all directions as we walked through the grass. I’ve never seen so many. Arachnophobes would have not been happy at all. 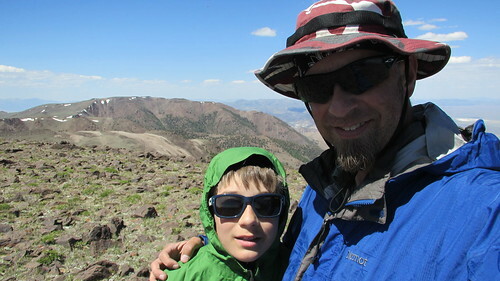 We climbed above treeline, and eventually made it to an intersection at the top of the canyon in a big bowl. Like most of the old signs along the trail, the sign at this intersection was barely readable and not much help. 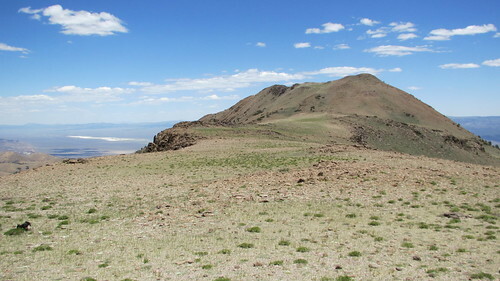 According to the map though, the trail to the right led towards the north peak, and the trail to the left, the south peak. 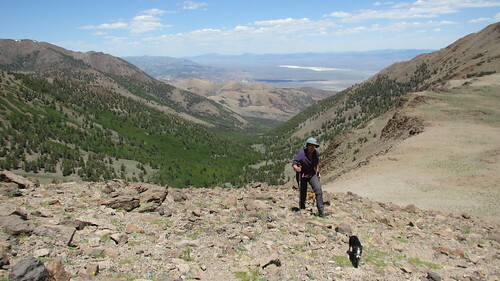 After another break, we traversed the bowl to the south, following a trail that took us up to a flat saddle below the south peak. Views up on the saddle were fantastic. We could see almost back down to camp from the direction we came, and down the other side we could see further south into Monitor Valley. The top of Mount Jefferson is not visible from this spot, so it was hard to visualize how much was left to climb. 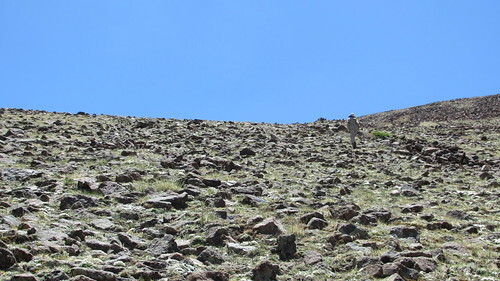 All we knew for sure was that the trail ended here, and the way ahead was straight up, following widely spaced rock cairns through scattered talus. We gathered some strength then pressed on. 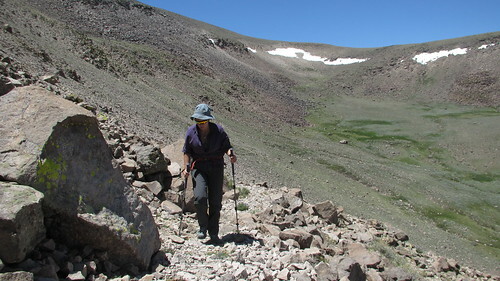 After making slow progress climbing straight up, the cairns led us south and the route leveled out a bit. 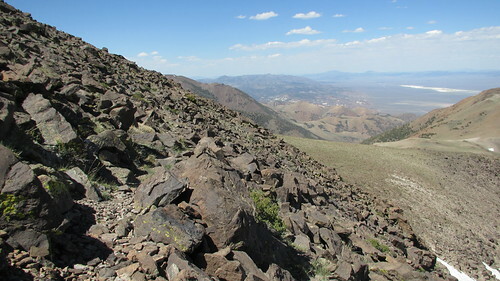 Eventually a trail forms where the talus gets thick. The peak was just above us now, but we weren’t sure the easiest route up. 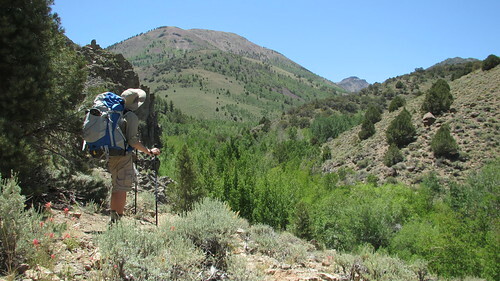 I thought the south side might be best, so we continued on the trail around the mountain. When we got to the south face though, there wasn’t a good route visible. We should have cut off the trail sooner. Still, we got our first view of the Big Smokey Valley, so all was not wasted. 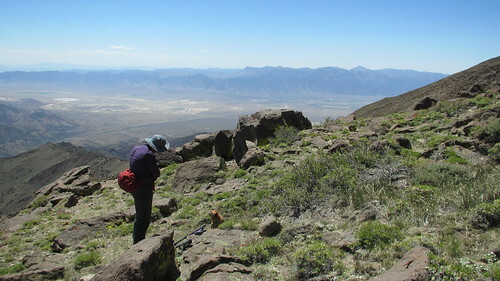 We returned to the high point of the trail, and picked out a route through the talus. It looked treacherous at first, but then it leveled out into a nice ramp that led straight up to the peak. At the top of the ramp, it was just a simple climb to the very top. 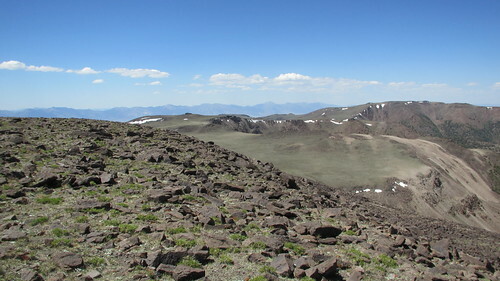 Unlike some of the tiny peaks we’ve been on, the south peak of Mount Jefferson is a big plateau. You have to walk around a lot to see off each side. 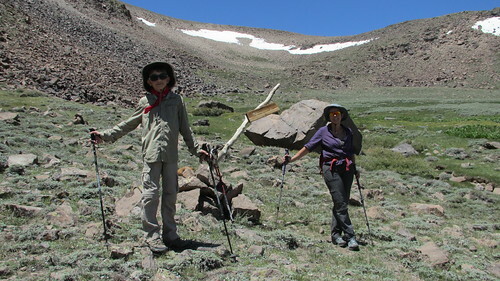 We found the highest point, a small pile of rocks with a stake, and celebrated with a photo. 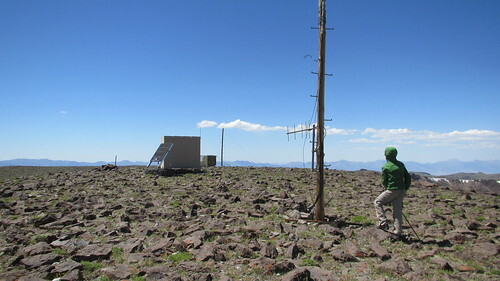 There are a number of communication instruments on the peak with cables connecting towers to some of the boxes. One box looked to be insulated, and a had a door with a handle like an old refrigerator. It wasn’t locked, so Charlie and I thought we’d get a quick peak at what was inside. I had only opened the door an inch when I heard the buzzing of a thousand insects. I was certain for a moment that I was going to be swarmed by bees and stung unmercifully. I slammed the door and backed away quickly. It took a few seconds, but I realized they weren’t bees at all. They were flies. Whatever was inside, I didn’t want to see it any longer. The spot where were camped looked really far away down below in the canyon. Dinner was sounding fantastic now, and there were a lot of steps between the peak and that macaroni and cheese. It was time to get going. Heading down the steep face of the mountain seemed almost as hard as climbing it. 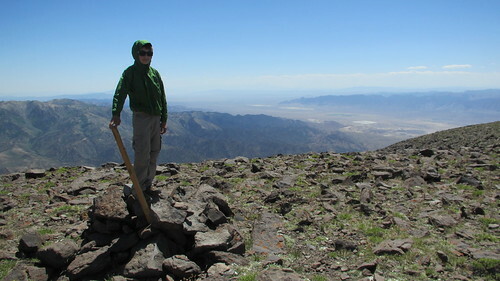 We retraced the cairns back down, thankful to finally reach the flat saddle below. From here, it actually felt like we could get a good hiking pace going again. 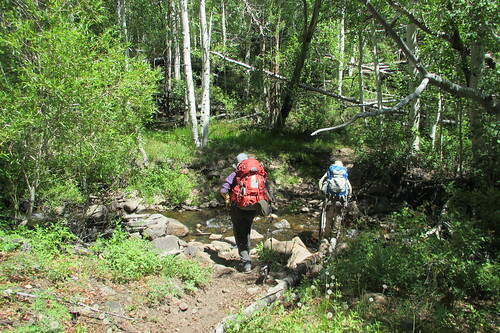 On our way back down to the Pine Creek canyon, we spotted two large animals crossing the bottom. It was too hard to identify what they were. I strained my eyes to see if they were the big horn sheep we were on the lookout for. 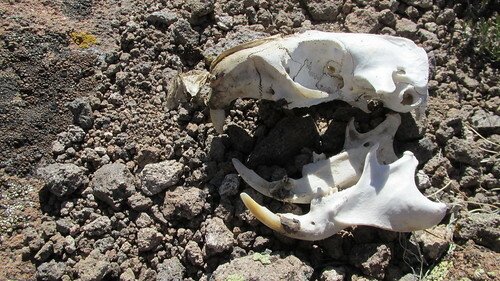 They could have also been deer or mountain lions. I suddenly remembered the binoculars I had accidentally left in the tent below. We tried to follow them with our eyes, but they disappeared into the landscape. When we got down to where we had saw them, we could hear the animals scrambling in the rocks above us. We never did figure out what they were. From our high vantage point, we could see the trail we missed on our ascent. The trail, it appeared, was actually on the north side of the creek. 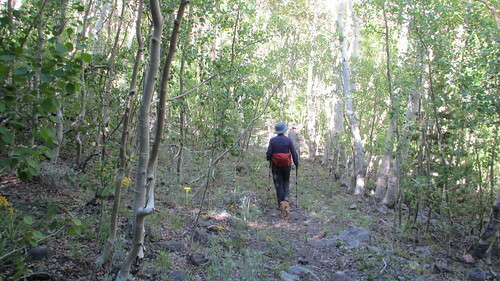 We made our way to the trail, and followed it into the aspens. It was easy to see why we missed it. The trail is somewhat overgrown, and concealed from the other side of the creek by the thick trees. It was also steep and slippery, and our tired legs slipped out from underneath us several times. This hidden section of trail eventually dropped us into the meadow where we had originally lost the trail. We had just missed it on the way up. We took a little time to mark it better, but I don’t know if the next hiker will have much more luck than we did. We continued on down the trail, dropping lots of elevation. I kept thinking that it was amazing that we had all climbed this. 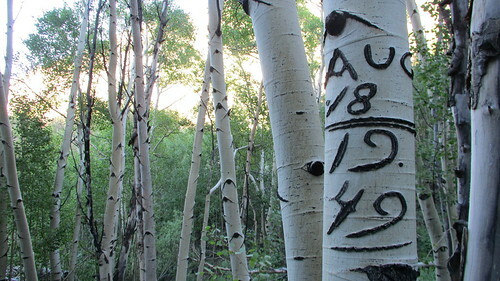 Continuing on through the aspens, we saw the marks that our predecessors had left. Some of the tree carvings were from the early 1900s. There was further evidence of previous activity too. Old rusty tin cans, heavy tools, and even areas that looked like they were graded to be a road at some time. There was probably a lot more activity in this canyon in the past than there is today. We were really happy to make it back to camp. A hot meal and comfortable bed awaited us in the near future, and the hardest part of the hike was now behind us. Charlie and I went off to filter more water, and Kristy got the dinner started. We enjoyed our macaroni and cheese around the fire, while finishing off the last of the wine. I awoke the next morning to the sounds of a crackling fire. 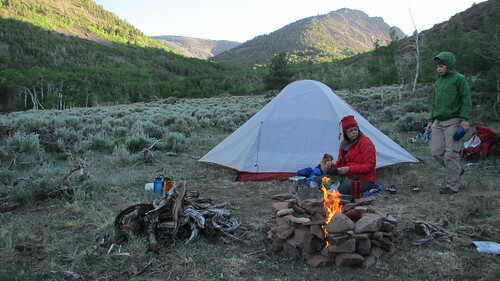 I emerged from the tent to find that Kristy had already built a campfire and was warming up. Using the fire starters we made from cotton balls and petroleum jelly, she said it was a snap. This made me smile not only because the fire felt great, but also because Kristy is learning more and more outdoor skills! We made coffee and tea, and discussed the plans for the day. We were both eager to hike out, the thought of soaking at Potts hot springs was plenty of motivation. 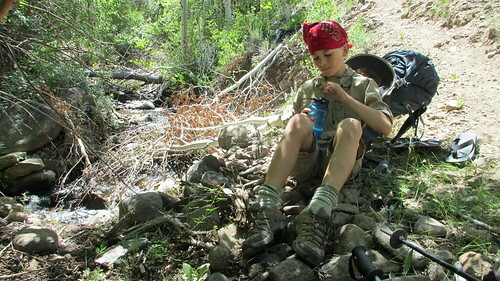 After the boy was awake, we packed up, cleaned up our camp, and filtered more water for the climb back down to the valley. Really starting to tick me off! 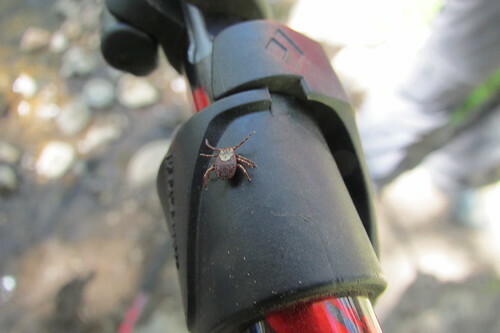 When we got back to the elevation we saw the ticks at, we went on high alert. 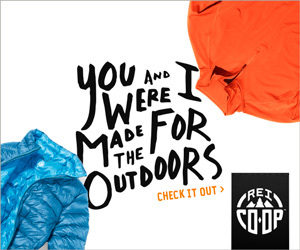 Sure enough they started appearing on my socks again, and I even found one climbing on my trekking pole. Kristy and Charlie were wearing long pants that morning, and didn’t pick up a single bug. It ended up being a good experiment. My exposed wool socks must have been ideal for the ticks to jump aboard. The smoother fabric on the pants seemed to keep them away. 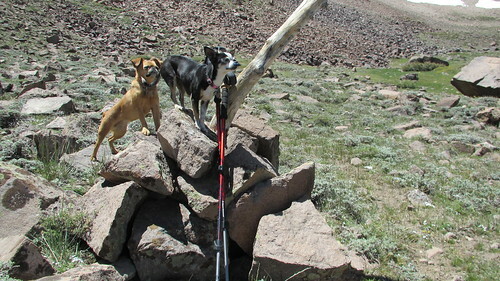 The dogs seemed to be still worn out from the previous day, and opted to be carried for at least half of the hike out. 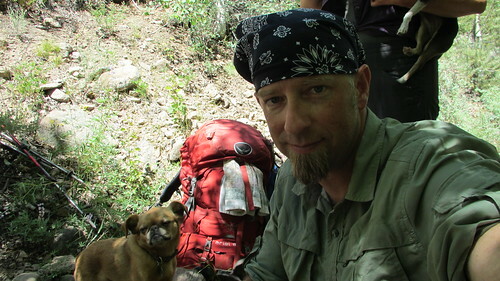 We all felt dog tired too, and were relieved when we finally exited the canyon for the final hike to the trailhead. Our vehicle was still there, undisturbed, and all alone. We quickly got out of our boots, and stowed the packs for the drive out. 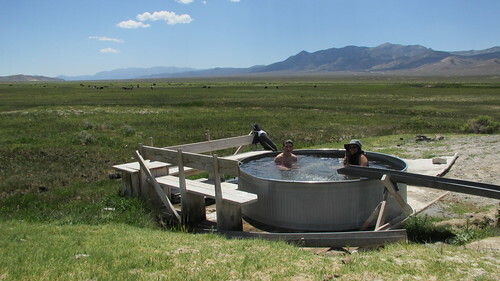 The day was really warming up down in the valley, and we weren’t sure how the hot tub was going to feel at this point. We all voted to check it out anyway. We arrived back at the hot springs, and began filling the tubs. We jumped in when the water was only a couple inches deep, and just let the water rise around us. Even the dogs were in the tub with us. At just over 100 degrees, the water felt heavenly. The water pouring into the tub from the flume was great for washing hair and soothing tired backs. After our relaxing soak, we retraced our route over Toquima Pass to Austin. After not seeing anyone for three days, it felt weird to rejoin civilization. Everyone on the road seemed to be in a hurry, and even the little town of Austin seemed like a buzzing metropolis. We enjoyed burgers, beer, fish and chips, and sundaes at the Toiyabe Cafe in Austin, and talked to a few touring cyclists making their way across the country. 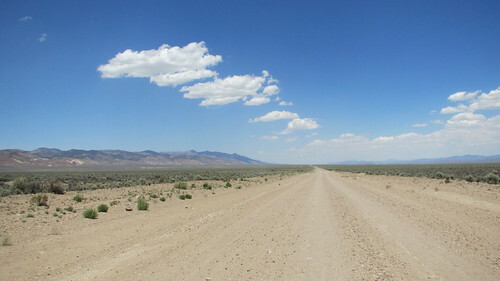 It was a windy and dusty drive back to Carson City. 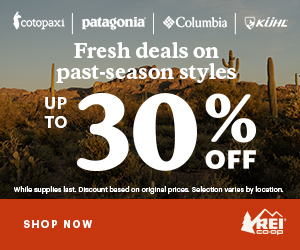 Along the way we slowly decompressed from life in the wilderness, and thought about real beds and showers. More photos from this trip can be found on Flickr here. that’s a nice chronicle of your adventure! 🙂 Let’s me know how nice the area is should i be able to convince Jen to go dessert (sic) camping! I’d love to go back there, even just to stay in the campground and explore more of the Monitor Valley. Ghost towns of Manhattan and Belmont are really close. We did a similar trip there last week of July. It was a great time. We had to drive several bulls away from Pine Creek Campground. Researched the controversy over cattle grazing in the wilderness area and found that subject just as fascinating as the rest of our trip there. There remain a few people who will still stand up and fight for their rights. Some recommend reading, “Storm over Rangelands” by Wayne Hage; http://www.rangemagazine.com/features/fall-08/fa08-victory.pdf. Thanks for the article! Definitely a hot issue. On one hand you don’t want to mess with tradition, heritage, and a family business that goes back several generations…people’s livelihoods. On the other hand, we have a better knowledge these days of the damage it can cause, and wilderness is threatened everywhere. 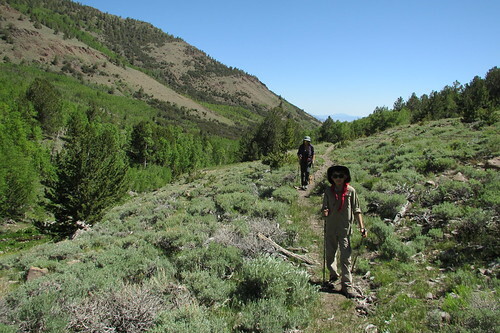 Our recent trip to the Carson-Iceberg wilderness was another look at things. Grazing has been banned in the area we visited to protect an endangered fish species. It was pristine. 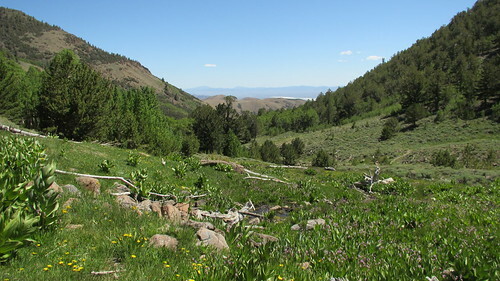 Our friend, formerly a backcountry ranger, said the meadows used to be a steaming mess of cow poop with flies everywhere. Potts hot spring has been closed and dismantled by the property owners. My daughter and I made it out there in August 2016 and had a nice soak. Glad we had the opportunity to enjoy it before it was closed down. 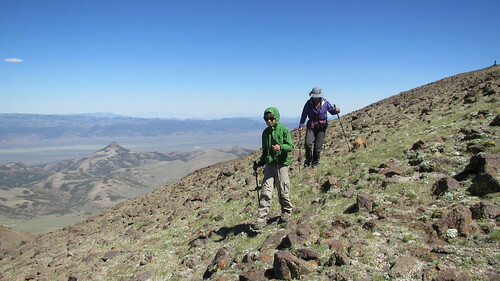 Perhaps my daughter and I will make it out there again and hike to the top of Mt. Jefferson. 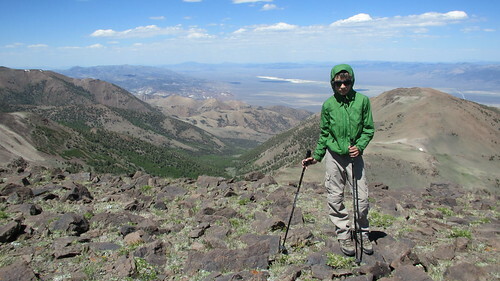 She currently lives on Vail, CO and is on a quest to climb the 54 peaks over 14,000 feet. So far she has three under her belt. I will be emailing her the link to your article. Thanks for sharing.